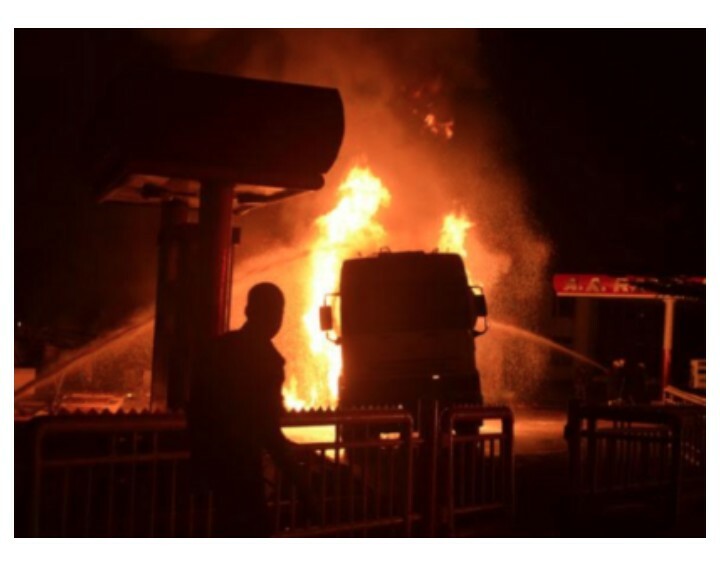 The situation on Friday afternoon at the Murtala Muhammed International Airport, Lagos was that of chaos occasioned by an inferno at the Forte Oil Petrol Station. The fire began at about 2:10pm and caused people to scamper for safety hence precipitating a traffic gridlock within the roads around and the ones leading to the airport. Spokesperson of the Lagos State police command, DSP Joseph Alabi informed journalists that trouble started when a fuel tanker was emptying it’s product into the reservoir at the petrol station. “A tanker driver came to discharge fuel for them and during the process, fire broke out but it has been put off now. “It was a disaster because everywhere was burnt down but there was no casualty. “They called fire fighters from Lagos State Fire Service and also fire fighters from the Federal Airports Authority of Nigeria (FAAN) responded. “It was through their efforts that the fire was put off without causing further damages to other nearby structures” Alabi said. Calm has since be restored to the area following the intervention from men of the fire department.